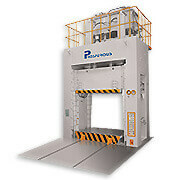 180° Reversing Spotting Press is used for mould spotting work. Besides, it's also applied for primitive spotting work for small-scale production. After the action of spotting and pressing, it can move lower die out, then move upper die out and reverse 180°. Upon the condition of spotting work, the technician can fit the faying surface of mould safely and delicately.